I had some leftover pumpkin pure, and I was working on this idea in my head of a beautiful dish with pumpkin and chicken and pasta and Gorgonzola. I had to do it! The pictured dish does not contain Gorgonzola though, because I am prego and I can't eat it. Yaaay me. No sushi. No Gorgonzola! I was really sad about it, but if you make this please try it with Gorgonzola, I think it would take it from awesome to amazing! 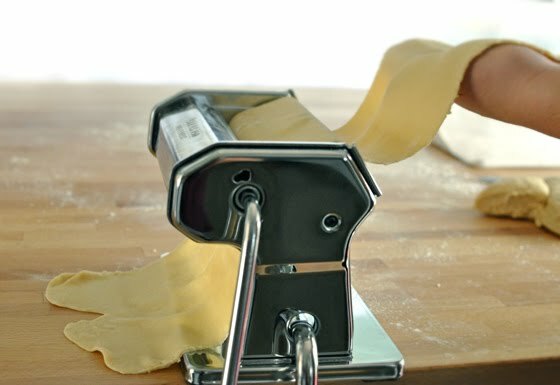 My hubby bought me a pasta maker for my birthday this Summer, and with us having a long trip to Croatia, coming back and trying to get back to our routine...making some fresh pasta dough just kept being pushed away. Until now. And yes, I feel so bad I waited this long, it was so easy and so soooo worth it. I will never by pre-made lasagna sheets again! Don't get me wrong, there is nothing wrong with them. I used them all my life and, OK, I lied. In a hurry, I will use them again :D (I like to over exaggerate), this dish will be delicious with them and I would recommend Barrila's flat lasagna sheets if buying them. 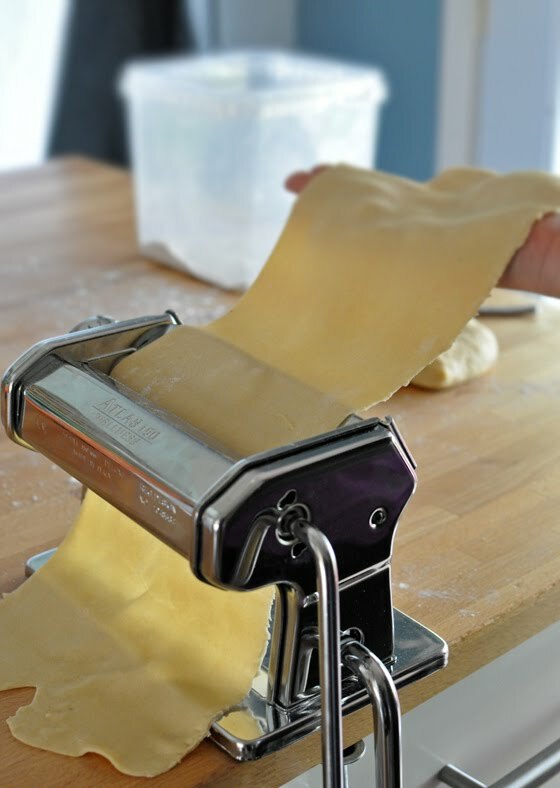 It is just that homemade pasta makes it just melt in your mouth, it's a big difference and it is worth it! I also had this idea that some caramelized onions would go nice with the pumpkin chicken and Gorgonzola combo, but this time I decided on skipping them, mainly because they cause me horrible heartburn right now :D, I will try the version with them sometime and will let you know how it was. Or you can try it and let me know! 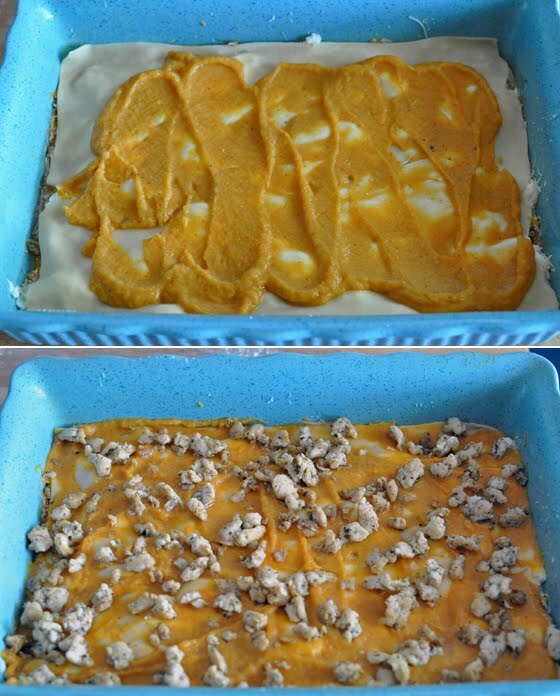 Since I had leftover pumpkin in the fridge, I went and used that, but you can certainly use a homemade one if you like. It can only be better, right? I used Ricotta and Parmesan cheese (bag for the inside of the lasagna and freshly grated Parmigiano Regiano for the garnish) and also finely diced chicken. 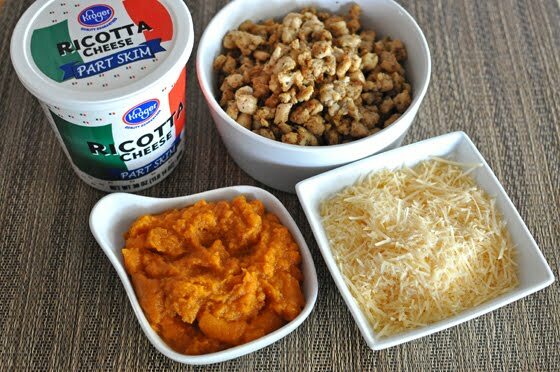 I would go with ground chicken or turkey if I had it, but I didn't want to bother with grinding it at home so I did the best I could when cutting it up to make it real nice and small. This was my first time making pasta dough, I read a lot of recipes and advice and decided on this combo and it worked out great for me. 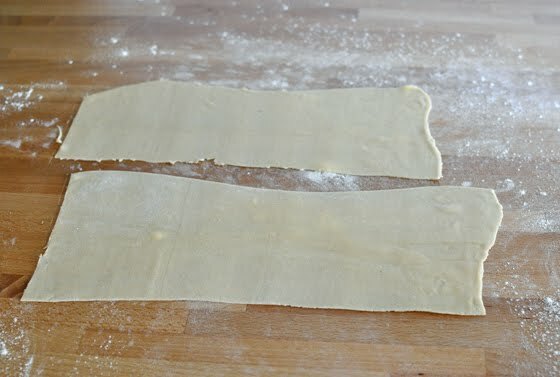 I barely had to use any extra flour when rolling the pasta. I just added the flour and the salt in my kitchen aid with the dough hook and added eggs one by one, I did it on a low setting (2) and when it started forming a ball I put it on 4. I let it knead for just a few minutes and then I wrapped it in a plastic wrap and put it int he fridge for 20 minutes. It came out pretty hard, I almost panicked...but decided to go on and pretend all is good....and it was. I cut the disk of dough in four pieces and flattened each one as I started working with them. I started at 0 setting and let it go through a few times, then I folded it in thirds and did it a few more times to get a bit more uniformed pieces. They still didn't came out as nice as the ones I saw on YouTube tutorials, but I just trimmed them where needed and it was perfect. I worked my way through each number all the way to nine and at the end I had a long piece that I cut and it fit perfectly into my pan. I repeated this three more times and had 4 layers all together. First I add a cup of Béchamel Sauce to the pumpkin puree, season it well with salt and pepper and mix. Brown the chicken or turkey on a little bit of oil, season it with salt and pepper, marjoram and cumin and set aside. 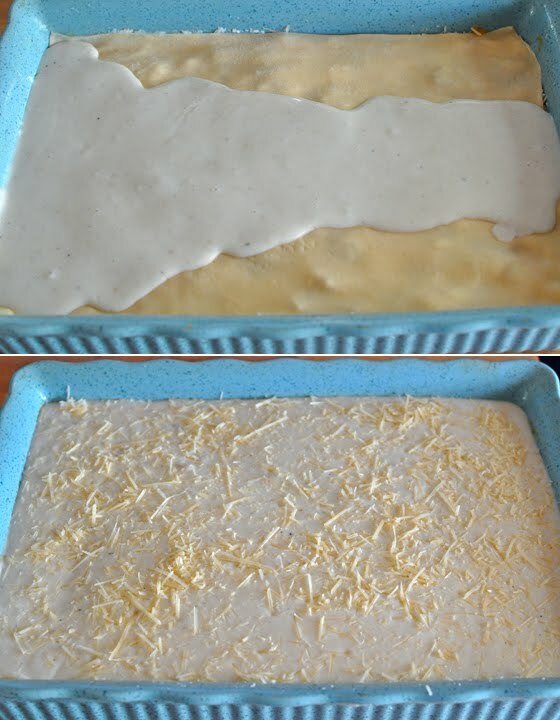 Prepare Béchamel Sauce (recipe underneath) and you are ready to start the layering. 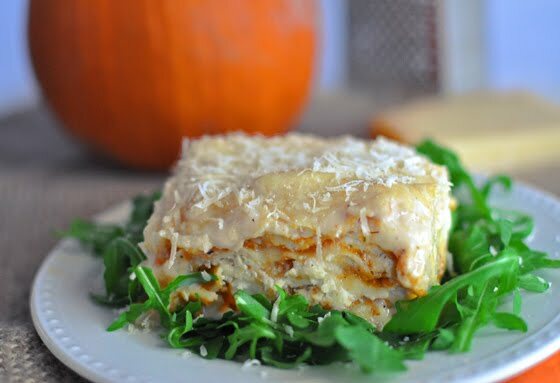 When layering lasagna I always start with a little bit of Béchamel Sauce on the bottom, then I put a layer of lasagna sheets, a third of pumpkin mixture, a third of chicken, a third of Ricotta a third cup of Gorgonzola and a quarter of Parmesan cheese. Second layer is the same, accept I add about 2 cups of Béchamel Sauce also, the third layer is the same as the first one. You finish it with the fourth layer which is just lasagna sheets and rest of the Béchamel Sauce and Parmesan Cheese. I baked my noodles at 375 for 40 minutes. If you are working with store bought sheets cook it for one and a half hour at 350 and make the Béchamel Sauce a little thinner. One of the best things for me here is that A. it freezes great, and B. I see myself doing this with leftover turkey, I love dishes that I can do this with, it saves me time, it saves the leftovers and makes something incredibly delicious and all new! 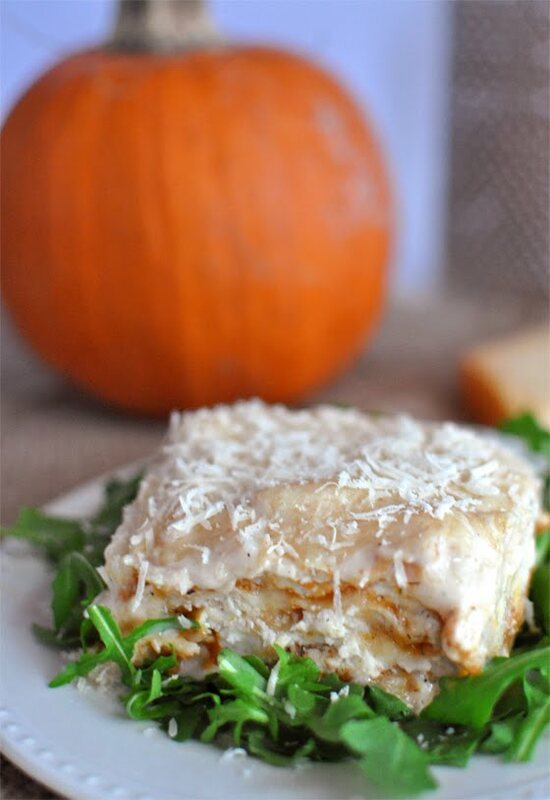 Everyone will love this lasagna, it is kicking some serious but. I am so sad I couldn't use Gorgonzola in it, but I will do it with Gorgonzola next Fall! 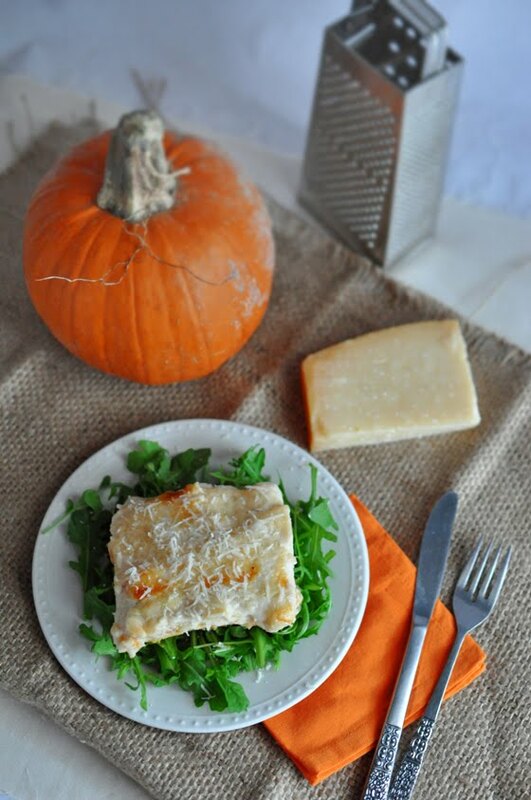 Until then I really enjoyed this savory pumpkin lasagna. I think I will reserve the caramelized onion idea for some enchiladas with pumpkin sauce. Doesn't that sound great? Wow, jako dobro mi izgledaju ove lazanje s bundevom! Jako fino! VERY creative!! 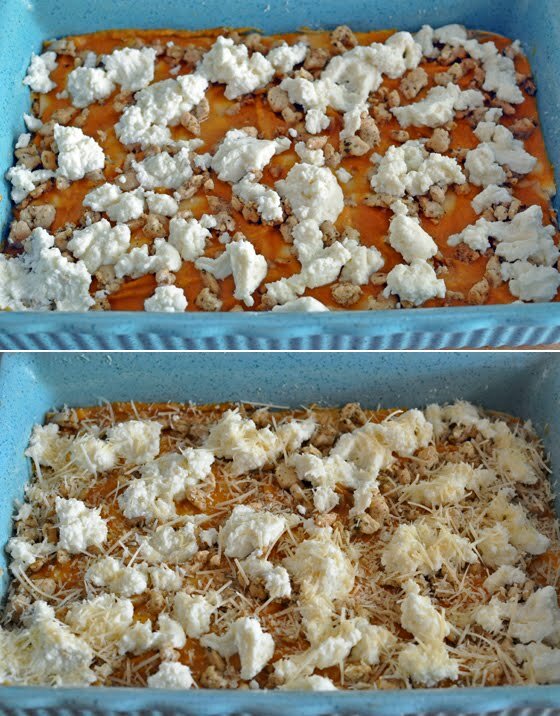 I love this lasagna idea. Pinning! Thanks so much for sharing.